Performing an infectious set of classic rock & roll from artists such as The Beatles, The Stones, The Who, Kinks, Small Faces, Elvis, Spencer Davis and many more. 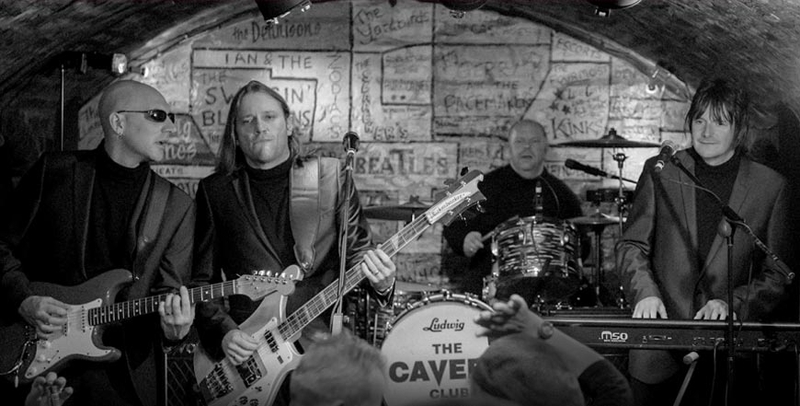 Their show is pretty much the history of the Cavern Club itself….. Following her chance meeting with The Rockits in 2011, John Lennon’s sister and Cavern Director Julia Baird quickly recommended them for a weekly residency at the Cavern Club. They have proved so successful in their regular Friday night slot that in January 2015 we offered them every Sunday in the cavern pub. It is not surprising that the Rockits have become one of the most requested live acts on the circuit; as well as popular regulars at our International Beatleweek Festival which takes place every year. Between them they have covered most aspects of the music business, touring and recording with many different bands throughout the world. Collectively as The Rockits they are one of the finest party Rock & Roll bands around delivering passion, energy and fun with every performance. Completely addictive and guaranteed to raise a smile.